This team of talented and conversion-hungry marketers then work together in a pod to maximise the results generated, with outputs optimised and scaled based on priorities and what’s working. No strategy is the same for any one client and what is often planned as an initial three-month strategy rapidly evolves and changes to get the best outcome. Fluid campaigns are pretty fun to work on for the team at Web Profits as we get the freedom to test new networks, channels, and techniques and contribute to the overall success of the campaign – something we’re all driven to do. Our clients also love it as they can reprioritise and adjust outputs based on their own internal goals over time… Plus we’re getting awesome results for their businesses. 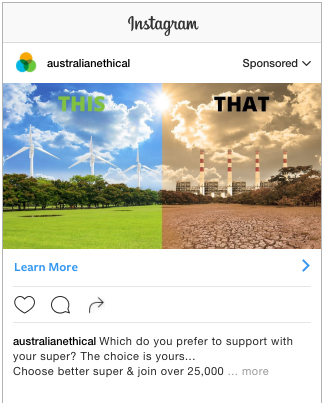 To give you an idea of how Fluid Online Marketing actually works, I’m going to run you through a campaign i’ve been working on for the past year for our client Australian Ethical Super, who came on board with us in July 2015. 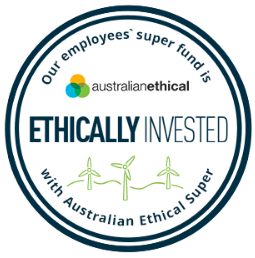 Australian Ethical Super, like their name suggests, offer an ethical and sustainable superannuation product, which only invests its member’s funds into businesses that align with a very stringent code of ethics – essentially companies that are doing good for the world, and refraining from doing harm. They also look for the best investment returns for their members, and they’ve done really well in that regard, with one of their super options generating a ten-year return of 8.3% (as at 30 June 2016). It’s a very strong product to market, as it aligns well with society’s move towards a more sustainable future (eg. the move to solar over coal), so there’s no doubt that the strong brand and strong offer have helped us achieve success. 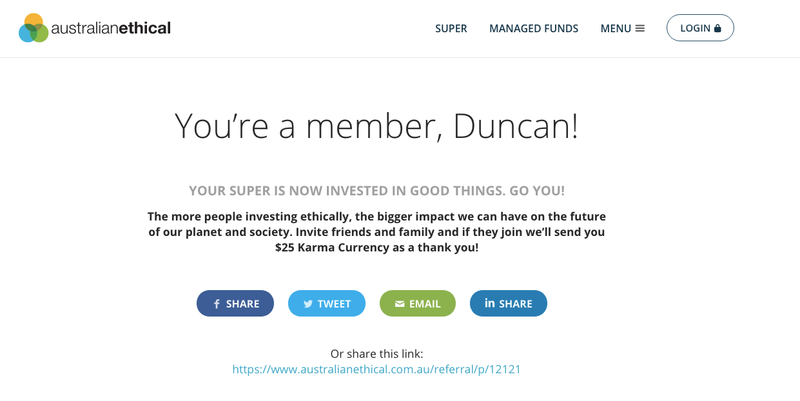 For Australian Ethical, a conversion is someone going through a signup process and actually switching their super then and there – so it’s a direct sale as opposed to a lead and as such, it’s more valuable, but harder to obtain. So how did we generate such impressive results? 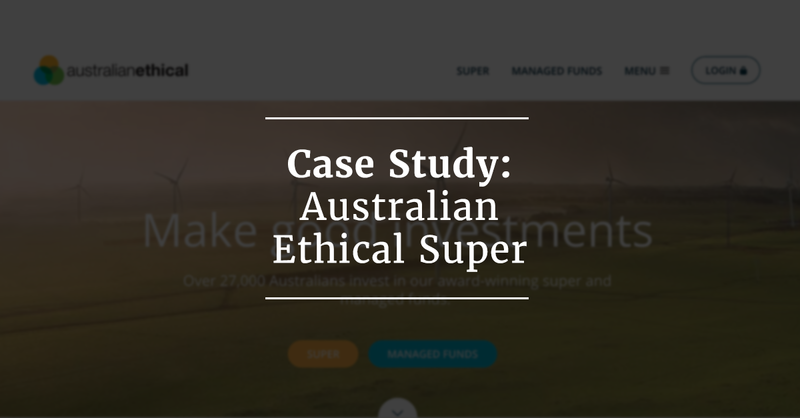 After a detailed scope meeting with Australian Ethical Super outlining their brand, their goals and what resources they had that we could leverage, we created an online marketing strategy that was shaped around building them a “marketing machine”. The plan was designed so that even if they had to shut down advertising for any reason in the future, they’d still generate a significant volume of super signups month-on-month. The strategy we created had both short-term elements to it (paid traffic, for example) and long-term elements (search engine optimisation, for example) – both equally important. Once the strategy was created, we formed the fluid team at Web Profits to carry it out. 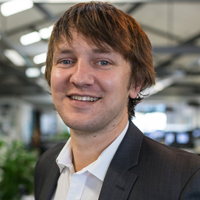 The team were selected based on their past experience and unique skills, and included myself as Growth Lead, Ales Pokora (Social), Matthew Siddle (CRO), Sophie McAulay (Content) and Nick Brogden (SEO). We then began to assign tasks and roll them out as quickly as possible. The tasks we set month-to-month were “fluid”, meaning that if something with a higher priority came up in any month or if one channel was getting amazing results, we could quickly divert resources and marketing spend into those areas to ensure we took advantage of the opportunities when they occurred – a good model for both parties, and more importantly, for results. They have an excellent, growth-focused internal marketing team who we collaborate with daily, led by Grace Palos and assisted by Caitlin Howlett and Karina Seljak. Driven by their Head of Ethics, Dr Stuart Palmer, they’ve built a brand with strong values, which align with those of their target market. They have little red tape, fast approvals and are also flexible with their branding – getting everything “perfect” brand-wise doesn’t hold us up from getting great results. The product/offer they have is a great one to sell and is in the market at the right time with consumers moving towards more ethical and sustainable consumption. They have unlimited ad spend budgets at profitable “cost per signup” levels, meaning we can maximise the volume of signups from each channel whilst knowing they are making a profit from every dollar spent. 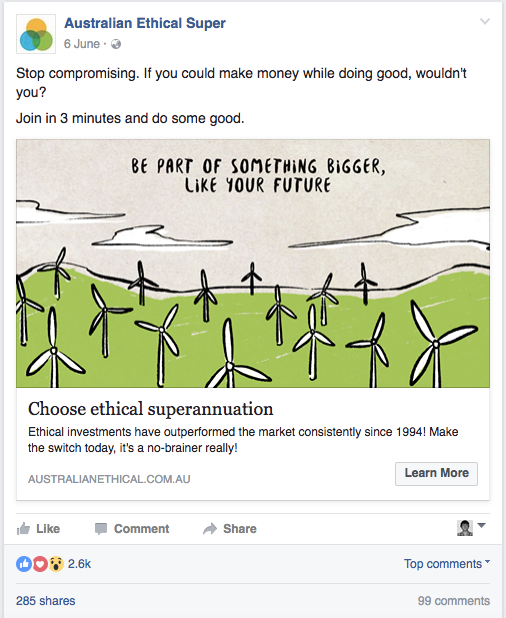 So what type of marketing have we actually built for Australian Ethical over the past year? Earlier in this case study I mentioned quick wins and in online marketing, there’s no quicker win than pay per click marketing. In under an hour, you can have your ads live on an ad network and be driving highly qualified traffic to your website or landing page. At Web Profits, we have no allegiance to any pay per click network and just use what works for each client. We’re still exploring new networks currently but here’s what we found worked this year. SEM, where you place your ads on certain keywords/search terms is one of the biggest online advertising channels around the world, with Google leading the pack in most countries (including Australia). We built highly targeted campaigns for Australian Ethical, targeting and testing a range of keywords and optimising them constantly based on the cost per signup and volume of signup metrics, to decrease costs and increase results. We also launched campaigns on Microsoft Bing’s search engines, an often ignored and forgotten about part of the SEM world. Whilst they used to have a less than 5% search share, recently with the launch of Windows 10 and their new Microsoft Edge browser they have jumped up to a 10.8% search share – a significant volume that can’t be ignored. We set up campaigns on Bing using their handy importer where you can literally copy and paste your successful Adwords campaigns across to their platform. Despite a much more limited volume of signups, there is not much competition on Bing (meaning cost per clicks are lower), so we managed to generate signups at a significantly lower rate than with Google. At these costs, to hit our very low cost per signup goals we would need a 10% conversion rate – something that’s not likely with an actual online signup. This counted out a large part of the search volume that we had to work with, so we had to get creative and find a range of ways to target ads that didn’t have as high a cost per click. The end result? 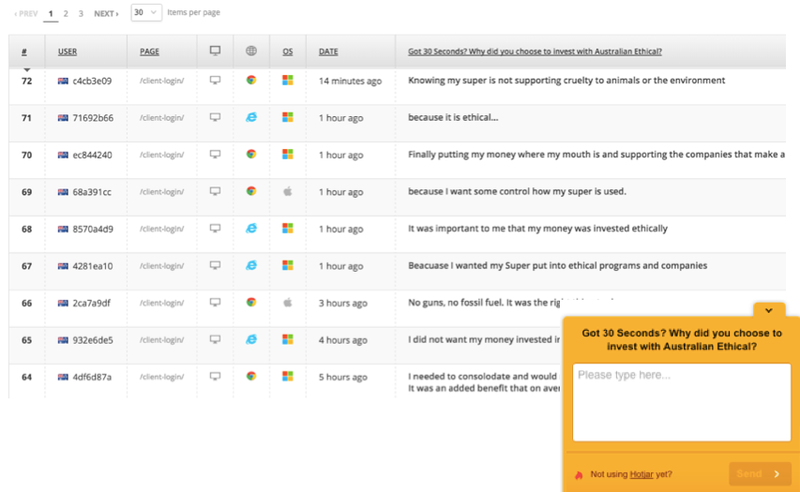 Much cheaper cost per signups than if we had just bid on “superannuation” keywords like everyone else. This example is just one of a number of campaigns we have built out, which are proving successful. Banner adverts were the first ever type of online marketing. This is an area that, whilst harder than search and more expensive on a cost per conversion basis (usually), still has a lot of potential volume-wise (once you’ve exhausted how much you can spend on SEM). In our view, the keyword, interest and demographic targeting that’s available for Google Display campaigns isn’t good enough to use (even with targeting, ads often appear on Justin Bieber meme sites). So we stuck purely to placing ads on specific sites that we chose as high quality and Australian-focused. 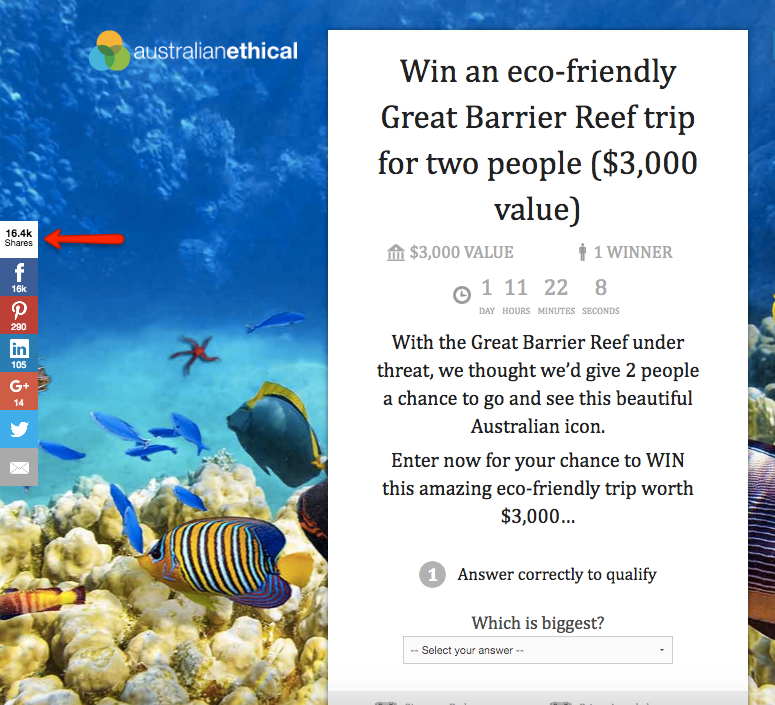 To do this, we used a range of tools and built a large list of websites that Australian Ethical’s target market were likely to be using, and then created campaigns targeting these specific placements on the Google Display Network. Some of the websites our banner and text ads appeared on included econews.com.au and superguide.com.au, with each placement optimised and bids adjusted based on conversion performance. 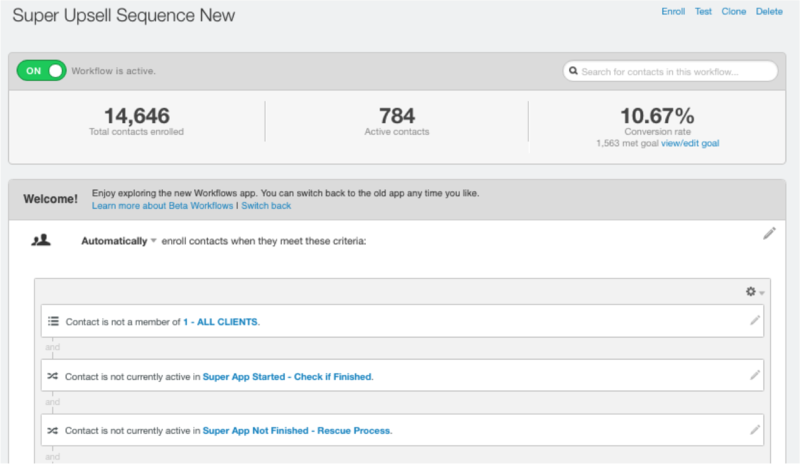 It’s important to note that all optimisation work utilised direct, click-based conversion data. We find that view-through or impression-based conversions (where someone was served your ad and possibly saw it, didn’t click it but later converted) are not reliable indicators of what made someone convert and thus choose not to report on them or optimise based on them. Remarketing is where you target a past website visitor with banner or text ads to entice them back to your website to convert. When Australian Ethical first came on board they were with Adroll, a third party retargeting company that optimises your ads automatically for you. 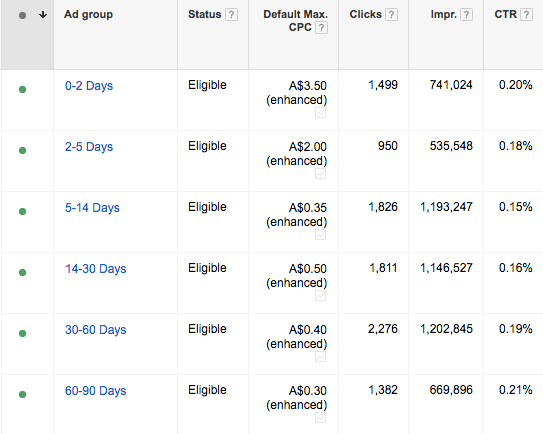 Upon auditing the results, we found they were getting next to no direct conversions, so we quickly stopped the ads. Instead, we set up individual campaigns on channels directly – such as Google’s Display Network or Facebook – so that we could control the optimisation of the ads manually. 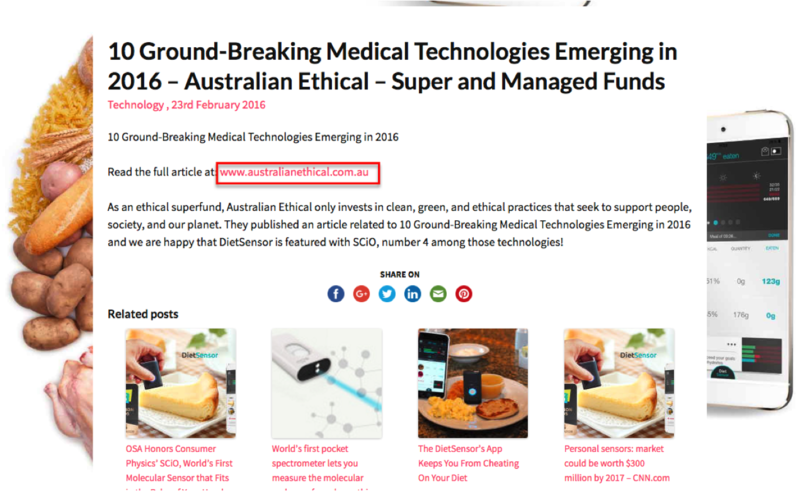 We ensured that everyone who did complete the signup for Australian Ethical were instantly removed from the remarketing pool. We also set up tagging on the login page of their website to exclude current members, and utilised a feature from both Google and Facebook where you can upload a database of email addresses (in this case, their current customers) and include or exclude them from a campaign. We divided the remaining audiences up based on the number of days it had been since they visited the website, with past experience showing us that the sooner we remarketed to them, the more likely they were to convert. We bid accordingly on each of these day-based audiences and optimised to achieve the highest volume of signups possible, at or below the target cost per signup. Another area of the Google advertising platform we explored and ran ads on successfully was GSPs. These ads are exclusive to Gmail’s email platform, and on both desktop and mobile devices appear as if they are emails within the person’s inbox. When clicked, they reveal a large image, a headline, copy and a call-to-action button. The best part about this type of advert is the targeting; essentially you can target users based on who is emailing them. So, for example, we added a target to the campaign of “greenpeace.org”, which meant that our advert showed in the inbox of people who had recently received an email from Greenpeace. We targeted both the subscribers of large, ethical organisations and also every other superannuation company we could find that were likely emailing their members regularly. 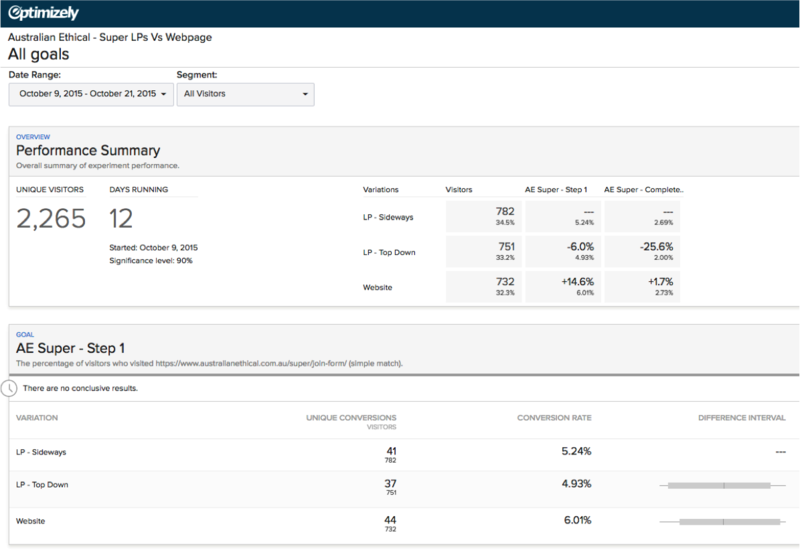 Google has been pushing Youtube Advertising pretty hard over the past few years, and given Youtube’s traffic volumes and potential audience size, we decided to try some conversion-focused video ads on the platform. The issue? We didn’t have any videos to work with that were relevant. Rather than spending 3-4 months and a lot of money building videos that may not work, we utilised a service called Veeroll, which allows you to create your own videos in minutes using their templates. Whilst from a branding point of view, these videos may not be exactly right, it enabled us to rapidly test what we could achieve on Youtube. What we found from testing a wide range of audiences, including remarketing, is that we could get sign ups direct from Youtube (you can add trackable links in your video ads directly to your website) but not at a cost per signup that made sense for us to spend budget there as opposed to other channels, so we quickly brought the campaigns to a close. The network, however, did show promise, so now we are spending time with Australian Ethical to create some higher quality videos to re-test and hopefully generate a meaningful volume of direct conversions at the right cost. Any brand that wants rapid growth cannot rely on search alone. Eventually you max out the traffic you can generate due to the volume of searches, and can no longer increase conversions. 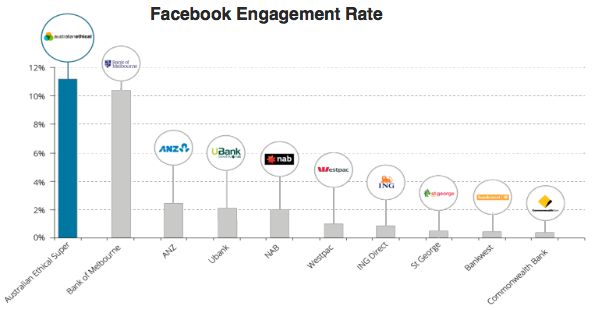 Social media, however, offers a huge audience of passive prospects with over 15 million Australians on Facebook alone. 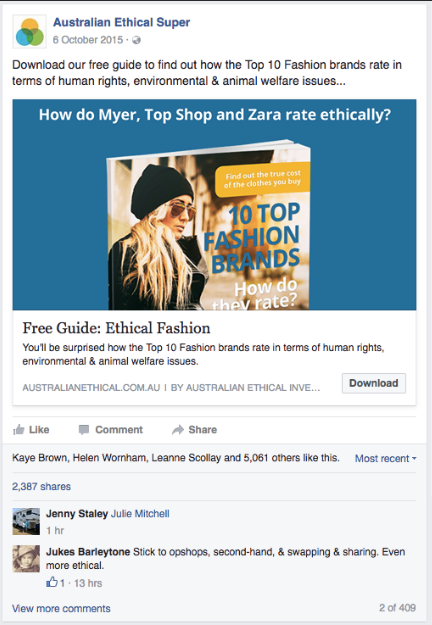 Over the past few years social media has now moved from a “brand building and engagement” platform to one that can generate meaningful conversions so this is an area we spent a lot of focus on for Australian Ethical. 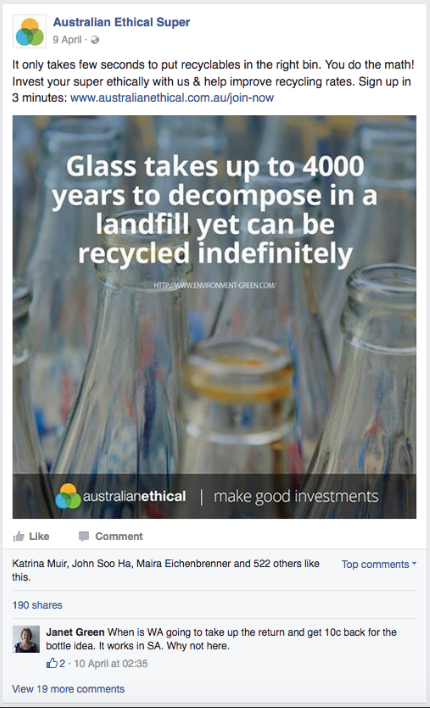 Australian Ethical were already active on Facebook so we took what they were already doing and using a conversion-focused approach, we optimised, improved and scaled the campaigns with the cost per signups and volume close to what we generated from our pay per click campaigns by the end of the year. Interests: Pollution, Sustainability, Renewable Energy, Environmental Movies (Black Fish etc), Climate Council, Recycling, Sea Shepherd etc. The most effective audience was remarketing, closely followed by lookalike audiences (an audience whose demographics, interests and other factors closely match an audience you define). 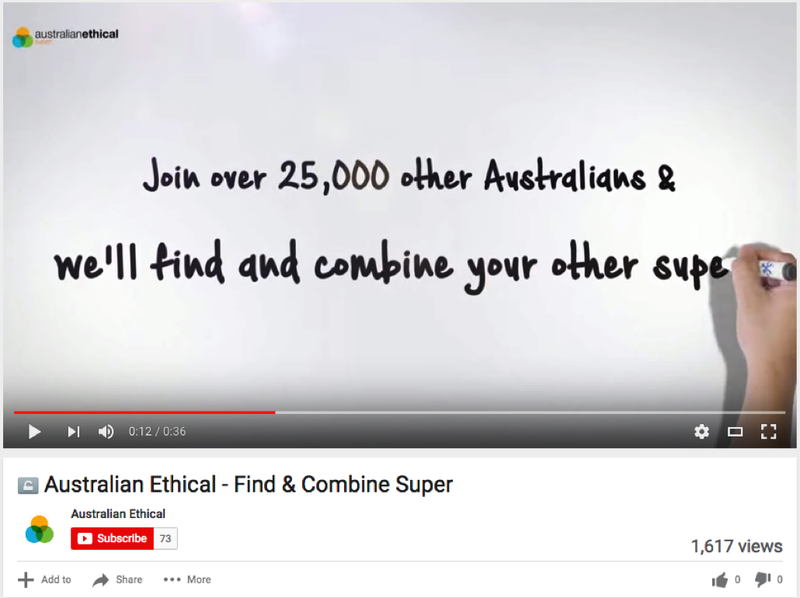 In this case, we uploaded all of Australian Ethical Super’s current members and then targeted lookalike audiences of them, as well as creating lookalikes of every other audience we had success with. Yes – you saw that correctly, our advert was shared an incredible 2,083 times and liked over 16,000 times. This generated free organic traffic to the website via the friends of everyone engaging with the ad, as well as a lot of signups. This is one of the advantages to marketing a brand people align with and are passionate about. We frequently updated and changed the ads (as the click through rate dropped off when the ads became stale) and tried both photo and graphical images. Along with generating direct conversions, social media is also a great way to push offers with less commitment required, such as an email capture. If the offer is good, a passive audience who is not looking for products or services then and there will respond at a far higher rate than to the straight conversion-focused campaigns – resulting in a cheaper cost per conversion. 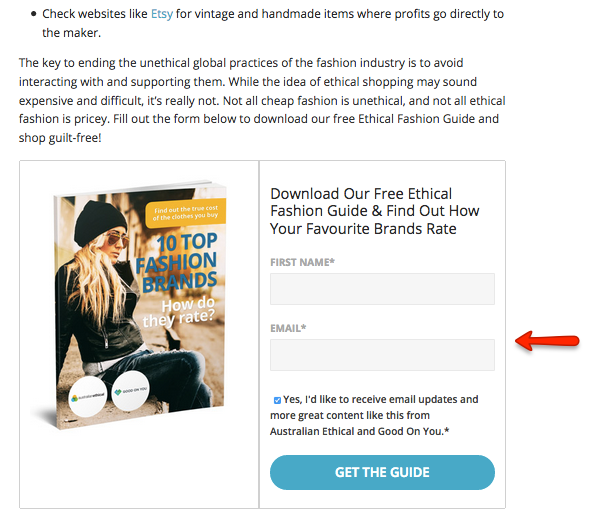 For Australian Ethical, we ran two types of email acquisition campaigns, and only launched them after we had created automated email sequences upselling switching to Australian Ethical – very important to have in place prior to launching these campaigns (more on the email marketing strategy below). Again we generated a significant number of shares and likes on the advert, lowering our “cost per email”, which we monitored closely with a target of just a few dollars per email address collected. Instead of asking people to “comment to win” or similar, we sent them to a landing page which had inbuilt viral functionality. As soon as people entered, they were then encouraged to share the competition on their own social accounts to receive 3 extra entries for every person who entered from their link – something that worked really well. Overall these campaigns generated over 30,000 email prospects in the database, who are now in the process of being converted into customers. A major concern from bigger brands about advertising on social media is fielding negative feedback and comments from “trolls”. Whilst this is a legitimate concern, with the right strategy, the negative feedback can be turned around in a way that will influence others who view the interaction. 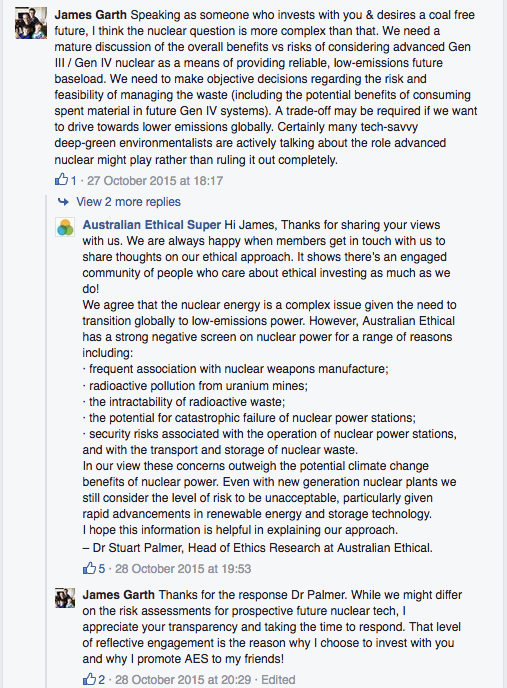 Hats off to the Australian Ethical internal team for handling the community management side of things with an unparalleled amount of effort being put into responding to each and every comment and question. This has helped our overall results and the building of a transparent and open brand which consumers, especially in this target market appreciate. Instagram’s self-service ad platform launched around a year ago and since then we have been experimenting with strategies to generate conversions. Advertising works the same as on Facebook, by targeting audiences; a bonus being that you can also target audiences you have already built on the Facebook ad platform. With almost all users on Instagram using a mobile device, succeeding requires a high mobile conversion rate. Through the year, we tested a range of ads and audiences on this network, along with posting all of the creative campaign content. Likely due to the complexity of switching your super then and there on a long form whilst on your mobile device, we found that the conversion-focused ads were not able to generate a high enough volume of cost-effective signups. Whilst a cross-device attribution model would likely show a number of users signing up later on a different device, we instead switched tact to focus on email acquisition ads – a much easier conversion for a mobile user to complete and one where the cost per acquisition compared closely with Facebook. We created a range of different ads including ones which targeted events that promoted sustainability and ethical practices (such as Earth Hour). Ultimately the remarketing audience performed best, but despite generating a significant volume of targeted traffic, we could not generate enough signups at a cost-effective level to continue spending money with Twitter – though it may be something we try again in the future. When Australian Ethical first came on board with us, they were doing little email marketing but had just signed up for Hubspot, which in my view is the number one email marketing system for small businesses. We were excited; we had a blank slate, an awesome system to work with and a brand that had a target market who are very interested in content. In less than a year, we quickly took their email marketing from generating no sign ups to delivering over 100 super sign ups a month at the end of the financial year. 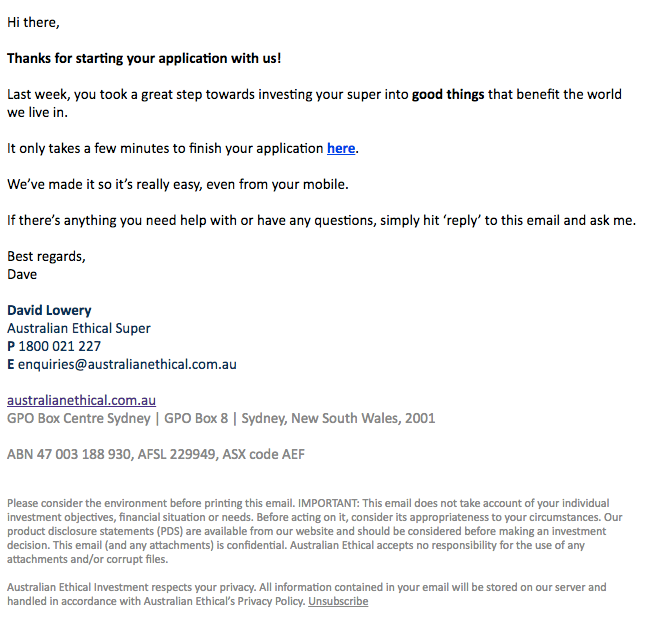 The email strategy we used is different from most agencies and businesses in that instead of sending out sales-focused and promotional emails all the time, we instead focused predominantly on sending out useful and interesting content, educating prospects and proving to them that Australian Ethical are the go-to business when it comes to ethical investing. With the plan in place, we then had our team of external sales copywriters write the copy for every email, created templates, and went about setting up automated sequences in Hubspot, ensuring people who we converted were removed from the sequences. With email acquisition going well and over 30,000 prospects generated over the year, we sent a lot of emails. The best part was that after the initial setup of the sequences, these were all automated, with the ROI growing rapidly over time and no scrambling to get a last minute newsletter sent out (which can only be used once). Improving the conversion rate of a website or landing page is the number one way you can significantly and rapidly increase the number of conversions being generated, because of the effect it has on all marketing channels. Having the highest conversion rate also allows you to spend more on marketing than your competitors (as every click results in that much more), which leads to higher volumes and therefore market share. For that reason, optimising and improving Australian Ethical’s website has been a priority for the campaign, starting with gathering data and then moving onto implementation and split testing of ideas. 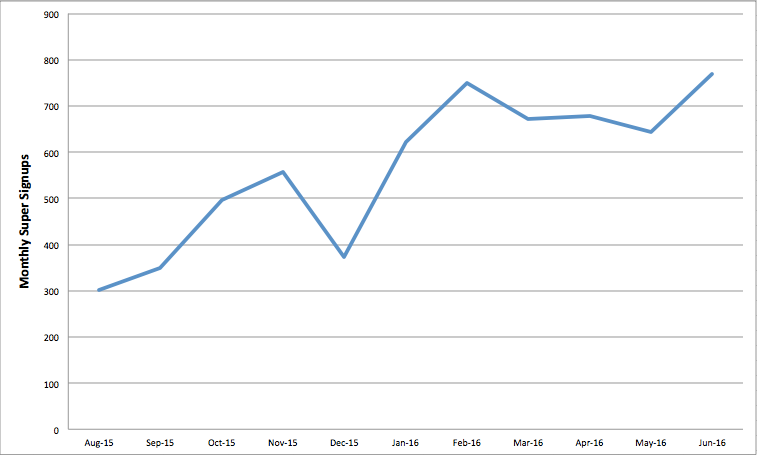 This data was then used to improve the marketing work we are doing. 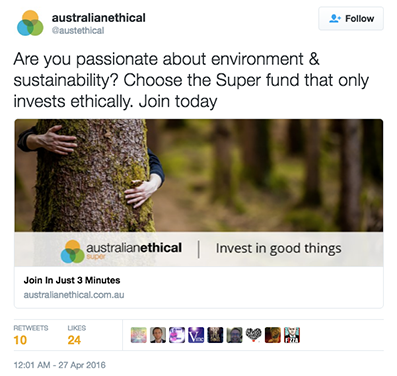 For example, we ran a survey on the login page and asked members what it was that made them invest their super with Australian Ethical. 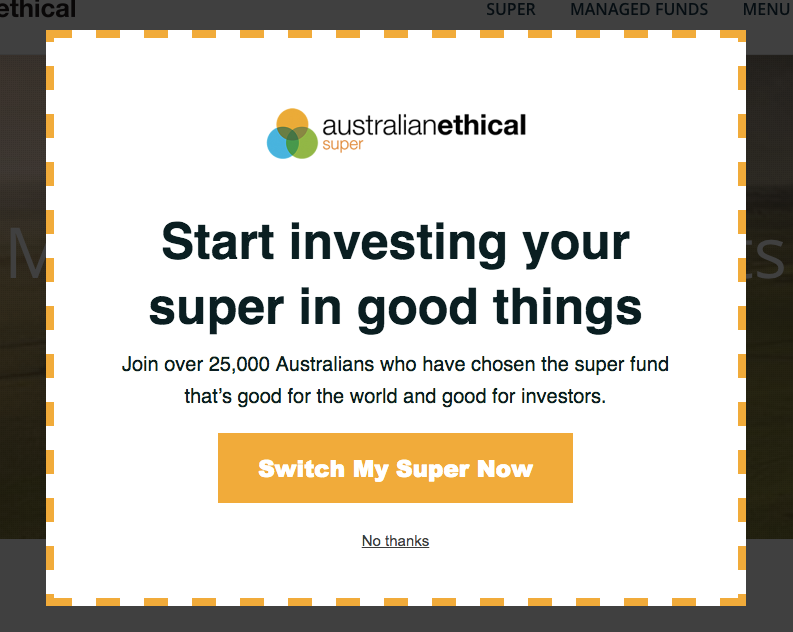 Contrary to our initial thoughts, the data suggested that being green/sustainable/fossil-free were the major reasons that people signed up (vs being ethical), which has led to us updating marketing, copy and also creating a new landing page focusing purely on this feature of the super fund. Given the long and complicated signup form, we also utilised screen recording where we can watch replays of people using the website (on 4x speed). We fine tuned this data to specifically find people who spent a lot of time on the form, but never completed it. Access to the recordings was passed to Australian Ethical’s developers, who are now constantly improving and updating the signup process. 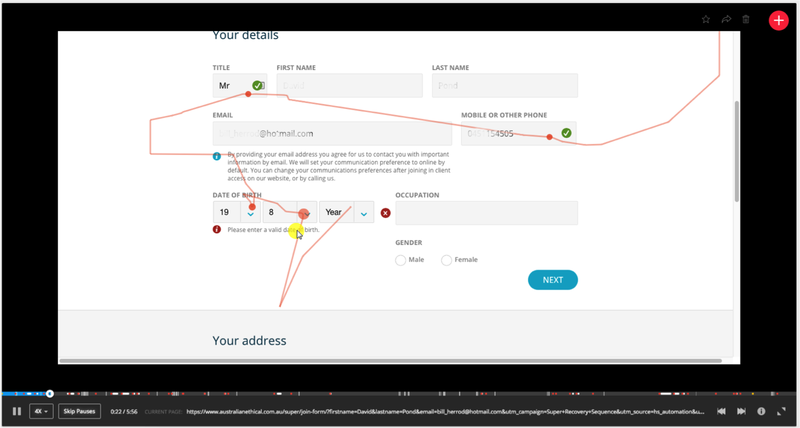 The data we gathered also led to split testing of both the website and specific landing pages that we created, with conversion tracking setup for step two of the form and those successfully completing signup. We declared split test winners from actual membership signups however if a new version of the page didn’t impact signups but significantly increased the people moving through to step two, we went with that version, as our autoresponder sequence to recover lost signups worked very well. Conversion Rate Optimisation is about a lot more than split testing and making gradual improvements to a website, and so we also looked for growth hacking-style techniques to improve the overall results of Australian Ethical’s marketing campaigns. Two examples of this were a referral program and exit detection popups. 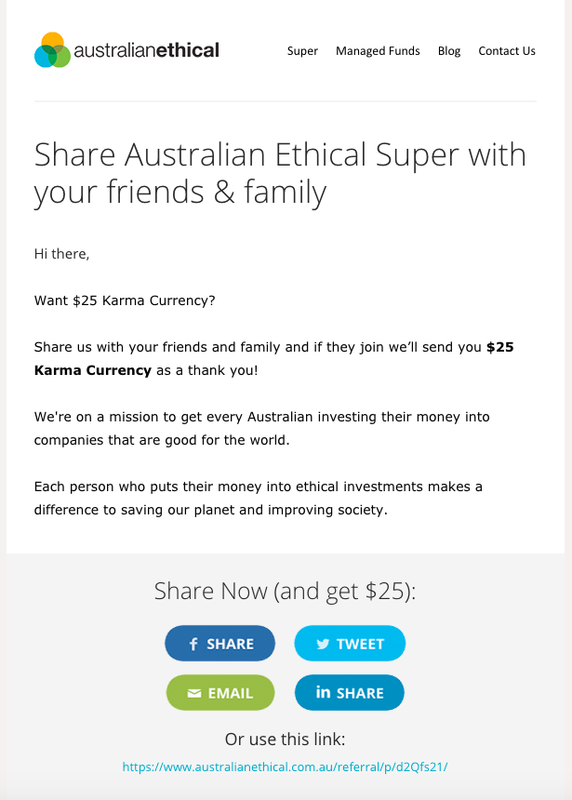 In conjunction with Australian Ethical, we created a referral program for current members, to receive a $25 Karma Currency voucher for every member they referred. We then updated the thanks page after a successful super signup to encourage this sharing – giving each person unique links for them to share on social media or via email. This small change to the thanks page has led to around 20 new super signups per month now being generated from referrals, as well as a lot of organic brand exposure. We’ve now decided to turn it into a members email marketing campaign to increase signups further. Another example of website optimisation work we implemented was Exit Detection popups. These were implemented across the website, blog and landing pages, and were set to trigger automatically if they detected the person was about to leave (determined by mouse movements). The popups were tracked separately and in one month alone assisted with over 50 of the conversions generated. Along with concentrating on the short-term and trying to generate as many conversions as possible, with Fluid Online Marketing campaigns we also look to build long-term success with outputs such as the autoresponder email sequences mentioned earlier setup to last years. Another longer term strategy we utilised is search engine optimisation, which over the past few years has changed considerably. It’s now no longer possible to target specific keywords and rank for them quickly, so we employ longer-term, white-hat strategies that over time will increase organic traffic and thus conversions. The first place to start with any SEO campaign is with onsite work, and after a thorough audit of how Australian Ethical’s website was setup and optimised, we began to implement a range of best practice techniques. These included extensive keyword research and the updating of all title and meta tags throughout the website. With the initial list checked off, we then began looking at what more we can do – for example, implementing schema markup on the website to push ratings and reviews into the organic search results, increasing the click through rate whenever their pages appeared. The second part of an SEO campaign is offsite link building, with links still playing a very big part in where a website ranks. 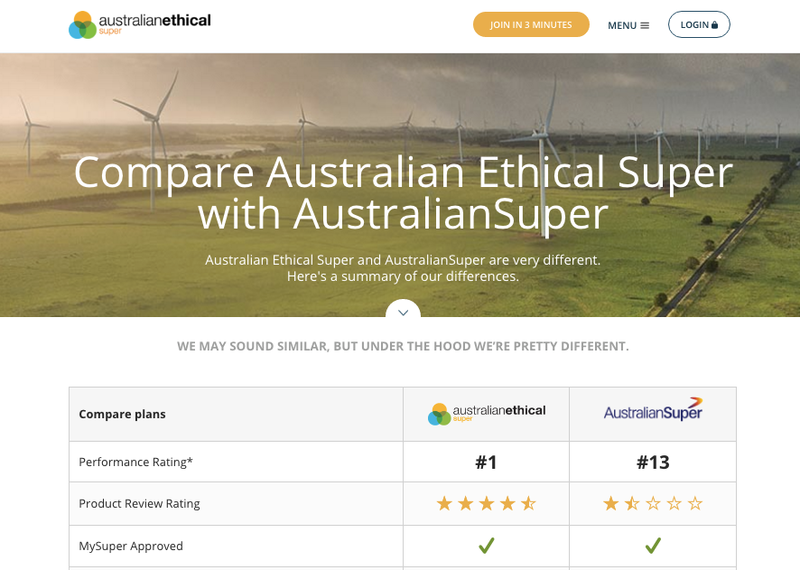 For Australian Ethical, this started with competitor audits of the sites that are ranking in the top positions on the keywords we want to target, to work out exactly what strategies they are using to obtain their ranking (something that’s different in every industry). We reviewed competitor’s websites and blogs and thoroughly analysed every backlink they had. 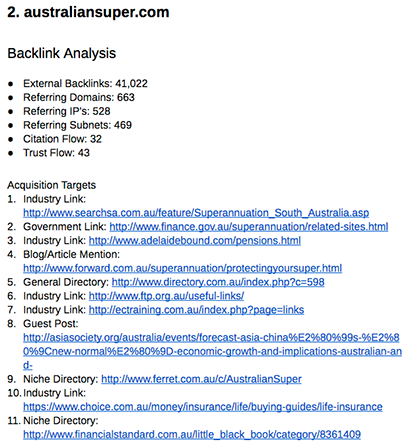 At the end of these audits, we had a huge list of “target” high-quality backlinks, which we knew would increase rankings for Australian Ethical if they could acquire them as well. 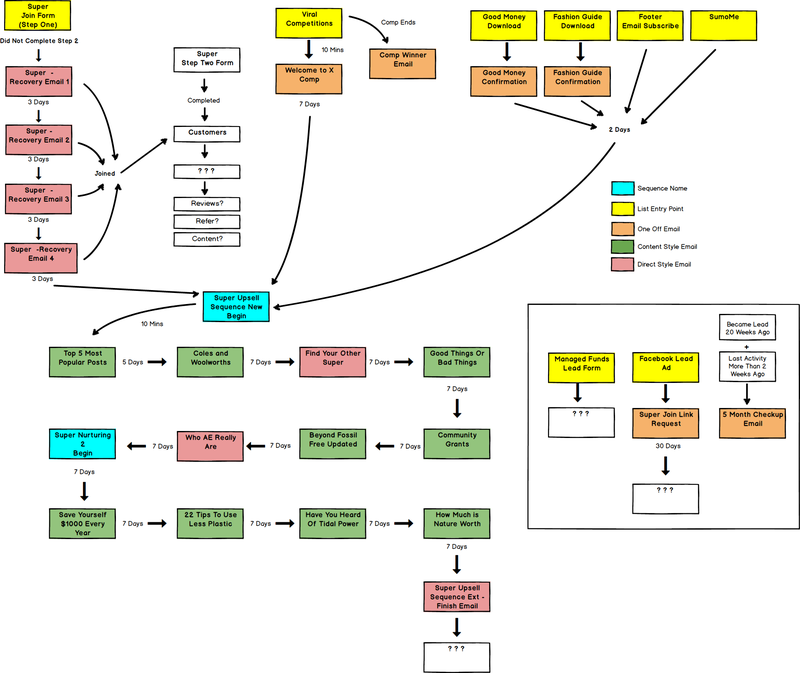 So using a variety of tactics, we built as many of those links as possible through the year. We also utilised large internal lists of backlink targets which we have created over years of performing SEO for companies around Australia and that we knew would have a positive impact. 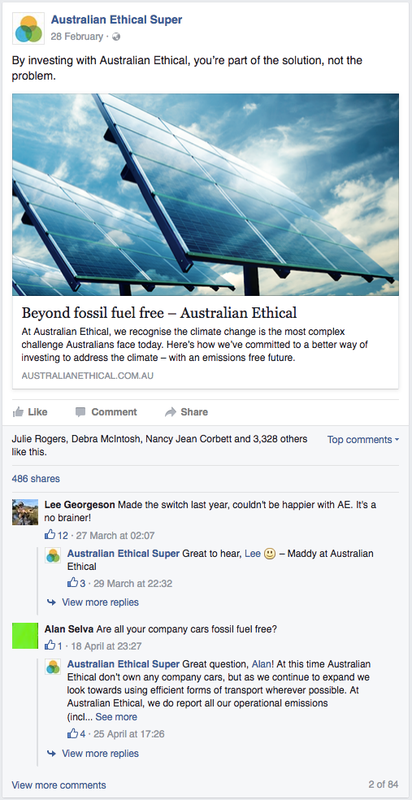 When Australian Ethical initially came on board, one of the things they were doing a great job of was content marketing. A blog, which they named “Good Money Blog“, was already in place, with regular content that appealed to the target market being written and shared. The strategies we employed looked to expand what they were already doing, generate more conversions on the blog and take things to the next level. It’s tempting with writing blog content to presume what the target market wants to hear about and get started on writing straight away. However, we use a different, data-driven approach to content to ensure we are writing the best possible content to generate links, social sharing and ultimately traffic & conversions. 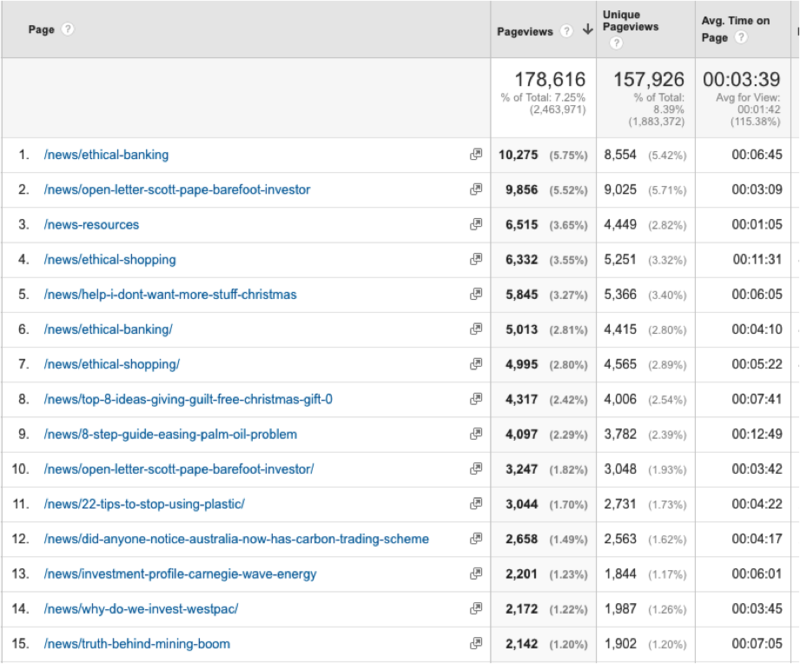 Along with using Google’s Keyword Planner to check that topics have a high enough volume of traffic to be worthwhile writing about, we also utilised a number of tools to conduct audits on competitors and industry blogs. We then quickly built a list of topics that are commonly shared and linked to in the industry and were able to work out which ones we could adapt and write better versions of. In-depth Articles, i.e. Why Are We Still Using Plastic Bags? 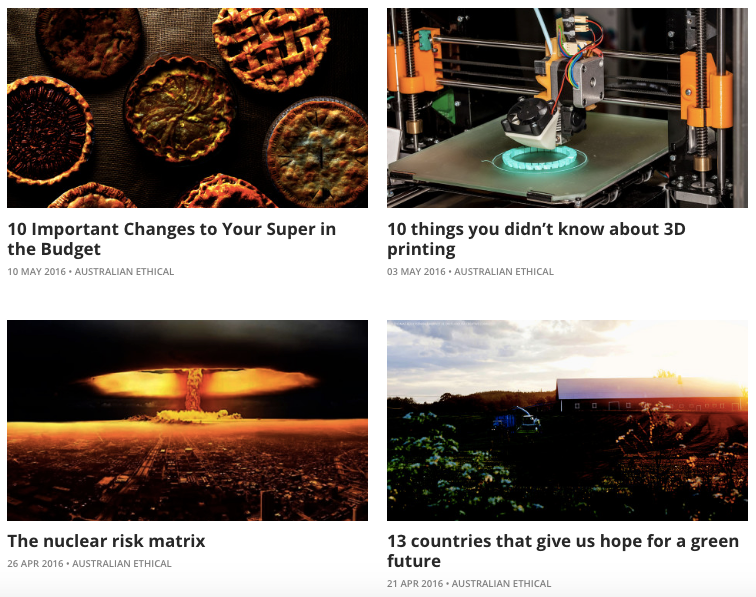 To ensure we got the most out of every piece of content we produced, we optimised the blog to capture email signups, which then went into our autoresponder sequences and were upsold to joining Australian Ethical. To do this, we utilised SumoMe’s suite of tools, including a Smart Bar, Scroll Box and Popup with messages and offers that we split tested and improved over time. Everyone who downloaded an eBook was pushed through an autoresponder sequence of other similar content and remarketed to with conversion-focused ads across all channels. It’s been a busy year working with Australian Ethical and the outputs above are just some of what we’ve achieved. Still, the fluid team all feel like we’re only just getting started, and now that we’ve set up a huge range of marketing campaigns we’ve got a great base to roll out a lot of other exciting future strategies and outputs, which we won’t disclose until they’re old news. Results are continuing to impress, with August’s result a record one and so far the team are on track to hit and hopefully exceed the financial year’s targets.